I'm Don Anderson, founder of Club Amplifiers. I hope you will find this site useful as you explore your sonic objectives. As I write this update in January 2018 I wish you all a happy new year. At the moment Club Amps is "on hold". My wife Susan and I are moving. This process will take about half a year. While in transition I'd love to hear from you, but I will be limiting my business activity. I have some inventory of demo and partially complete Club Classic Series II amps. I'll be introducing some new amps later in the year. So, please stay in touch. Club Amplifiers is proud to be a sponsor of the San Jose Jazz Summer Fest. 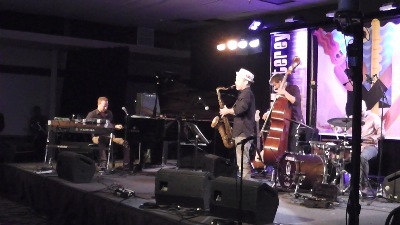 We have been providing amplifiers for San Jose Jazz sponsored events for several years now. Every year the festival is amazing. From blues to Latin to funk to jazz there is tremendous diversity. If you're in the Bay Area the second weekend in August you will want to be there. OBTW, it's affordable. Club Amps is also please to support the Monterey Jazz Festival. 2) Very big, full, detailed, articulate sound! 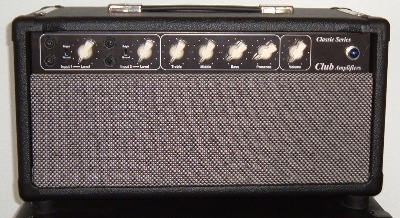 A Series II Club Classic Head. Simple elegance. Based on the core architecture of the classic '59 Bassman and early Marshall clones, the Club Classic has a much more muscular and detailed tone. 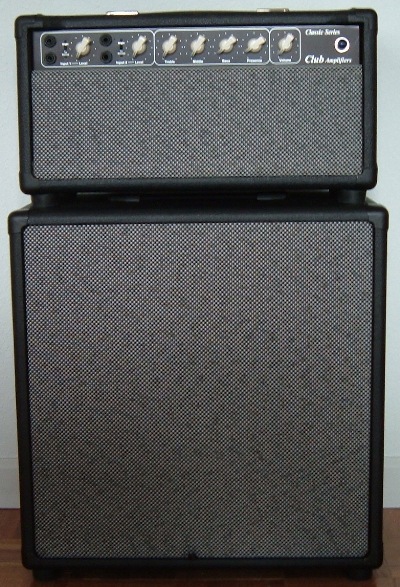 Club Classic Head on a 1x15 cab. We are big on 15s. We are pleased to now feature the Celestion Fullback 15 in our lineup. We have several very special custom 15s. They move a lot of air but are very easy to transport. Our 15s are very detailed and lively. At a loud venue they can make the difference between being heard....or not. Got a small amp that you love, but won't cut it at live gigs? Stack it on top of one of our 15s. 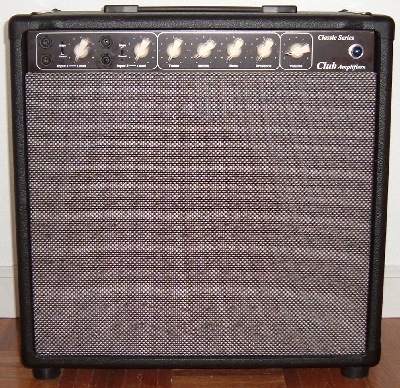 Series II Club Classic 1x12 combo. Small but very potent; available with 15W-55W of power. Available with a broad range of speakers from Celestion, Eminence and Weber. 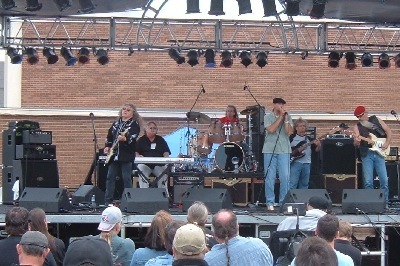 Mouse Mays of Point Blank on the left performing with a 50W Club Classic EL34 head at the Dallas International Guitar Festival. The "tiny" Club head is sitting on top of a Peavey head and 4x12 cab (This was the Peavey stage). Our thanks to Mouse for choosing Club. It sounded amazing! The late Larry Coryell playing a Club 50W 1x15 Reverb Combo at Kuumbwa Jazz. He is missed! Extraordinary singer-guitar player Martin Luther playing a Club 30W 2x10 Reverb Combo at the Monterey Jazz Festival. There are actually two Club Amps on stage. Can you see the second one? Renowned keyboardist Brian Jackson chose a Club 50W 1x15 Reverb Combo to get the sound he was looking for from his Rhodes piano. It's all the way at the left. Brian turned the amp towards himself (away from the audience) so he could hear himself as clearly as possible then mic-ed the amp through the PA for the audience. There's a black Yamaha grand piano behind the Club Amp, but if you look closely you can see the power tubes glowing. Keyboard wizard Craig Taiborn chose a Club 20W combo for the first of his two performances at the Monterey Jazz Festival. 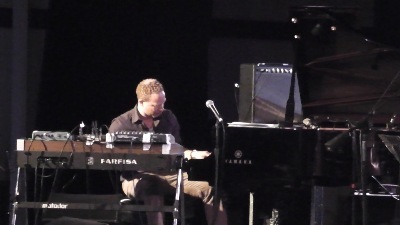 For this highly inventive performance Craig had the Club Amp "aimed" into the cavity of a Yamaha Grand Piano. He played a vintage Farfisa drawbar keyboard through the Club Amp to resonate with the Yamaha Grand. It was a very interesting and impressive performance. Blues sensation Murali Coryell on the Blues Stage at the San Jose Jazz Festival. The house was "groovin" to Murali's blues with a R&B flavor. Murali was playing through a 50W 1x15 reverb combo. Murali was kind enough to make a special announcement to the crowd that Club Amplifiers was delivering his tone. Club Amps have amazing detail; for electric guitar of all styles, acoustic guitar, and keyboards. 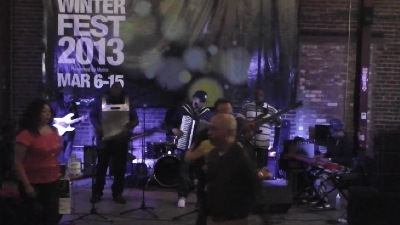 Note in this picture from the San Jose Jazz Association Winterfest, that two artists from the Andre Thierry Zaydego Band chose to use Club Amplifiers; guitar and keyboard. The guitar amp is hard to see behind the washboard player. We appreciated this Myspace post from our good friend Lello D'Angelo from Milano, Italy. He's been a Club Amp owner for years. 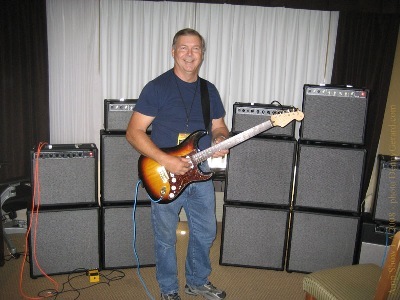 He play's his Club Head through a 2x12 cab with some seriously vintage Celestions. His rock and rockin blues are first rate. We build amps as our primary mission. We are boutique, not a factory. You could say our permanent web site is still under construction, but our priority is on building amps. In fact, this site is in re-design, but we've been saying that for very long time. It will change eventually. Because most everything we make is to customer criteria the normal "shopping carts" of e-commerce don't work very well. If you're interested in a Club Amp drop us an email at info@clubamps.com. This site contains a lot of information, perhaps more than many musicians would want. But, over the years we've found that our happiest clients are the ones who have put some serious thought and research into what they "really" want. If you are not familiar with our company or our product I encourage you to start by taking a look at the "Products" page. Check out the product page first, then take a careful look at the About Us page and "Why Club Amps?" We've been building amps for a very long time. We make a really great amp. I hope we'll be building an amp for you soon.